Severe Floding In TX, I-35 closed at San Marcos; County Road bridge washed out. I-35 was closed at San Marcos because it was flooded by the Blanco River, but is back open now. In Dallas, Flooding on the Trinity River is interfering with construction of the new I-30 bridge. 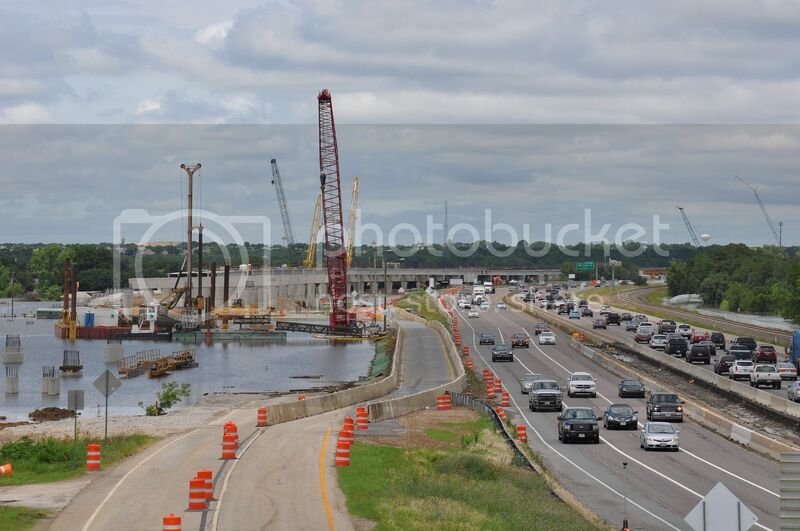 In Lewisville, at Lake Lewisville, high water levels are interfering with construction of the new I-35E bridge. North of Denton, they are trying hard to prevent Lake Ray Roberts from going over it's spillway. It's spillway dumps into a tiny creek, so if a lot of water goes over it, it will wipe out FM 2153 in probably two places, and could threaten FM 428. it would probably scour out the creek channel and make it much wider and possibly deeper. I'm surprised that it is designed this way. I'm wondering why they did not put the spillway at the end of the dam, so it could dump directly into the main river channel, instead of having to use a tiny creek that can't handle it to get there. the spillway is to the left of the dam. To the right is the end of the spillway channel. Notice how tiny the culvert is. it was there before the lake and spillway were built. There has also been a lot of tornadoes. There was another one last night. Re: Severe Floding In TX, I-35 closed at San Marcos; County Road bridge washed out. Lake Texoma's spillway is designed the same way. It spills into a relatively small creek that feeds into the Red River. It went over the spillway this morning and has already inundated the highway that leads to Denison Dam, so sightseers have to detour all the way around to the Oklahoma end and cross the dam. I remember some years back when the Hill Country was flooding that Canyon Lake went over its spillway. Officials were nervous because that had never happened and they didn't know what it would do. The spillway is a natural canyon that goes up a ridge beside the dam. The canyon drops 150 feet in less than a mile. There was a web page put up, I wish I could remember where, with photos showing the damage to the canyon. It cut a significant channel all the way to the river. I think this was in 2002. Google Earth's historical imagery shows a natural-looking canyon, with the top carved to form the spillway top, in 1995, and in 2004 the channel is visible. Street View from the bridge shows what it looks like from ground level. Now we know what happens when it spills over, and there's already a channel to carry the water next time. Back in 1981, when Grapevine Lake went over it's spillway, it washed out Fairway Dr, cutting off Flower Mound from DFW Airport, and cut a deep new canyon. One of the big reasons the canyon was cut is that the spillway channel had a significant drop in elevation over it's short trip to Denton Creek, which is the main channel that is dammed. That big hole below the spillway is the result of this, and the Corp's efforts to "clean up" the erosion caused by this event. Also, this hole holds water, enough to absorb some the energy of the water coming over the spillway. TxDOT's lost a couple of bridges. Photographs of two are in this Facebook album. I-69/US 59 is reported to be underwater at Houston. 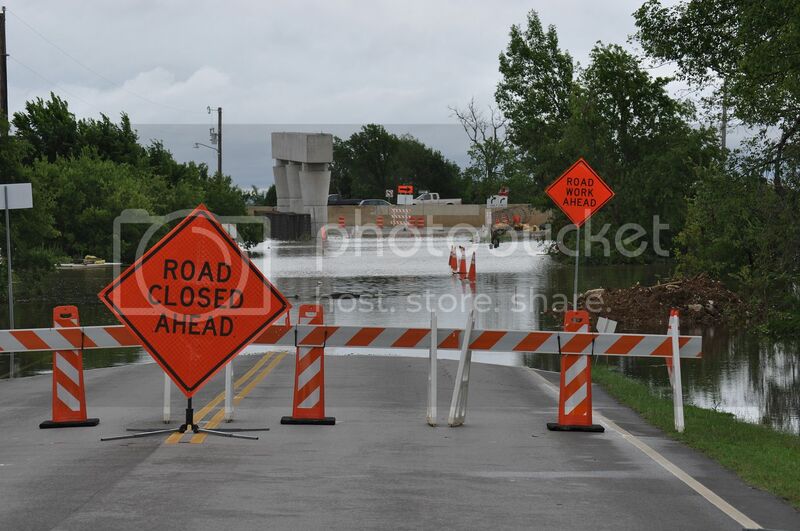 News reports say that the US 70 bridge over Lake Texoma (in OK) has closed. Oklahoma got a lot of rain last night. Lake Lewisville reached its highest level ever. Saturday, it was four feet over spillway. Below the lake, water was nearly up to BUSINESS 121, some businesses were flooded at BUS 121 and Valley Ridge Blvd. 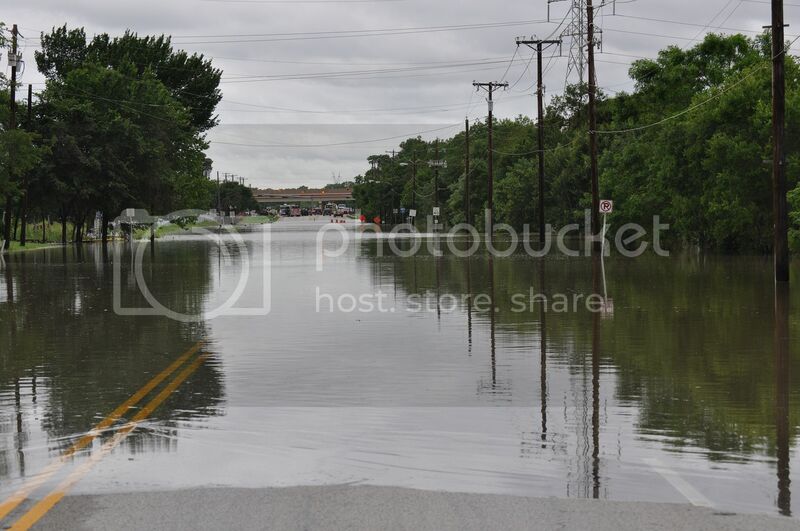 Lake Ray Roberts flooded US 377 either side of Tioga. 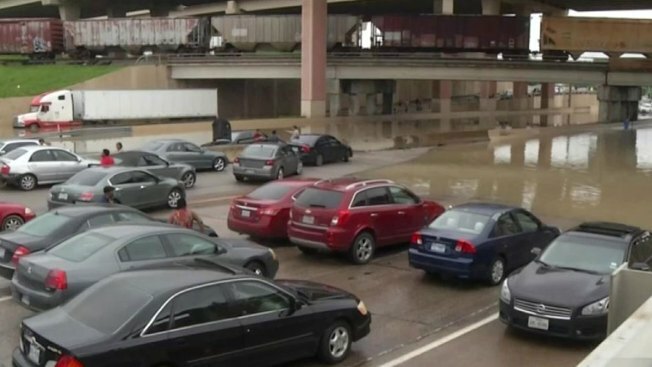 Dallas:LOOP 12 flooded under I-30, and the water won't drain due to high water in creek; drivers trapped until TxDOT brings in crane to remove median barrier. It's still closed. Today, 5 days later, Shoal Creek in Austin looks just like it used to. They sure subside quickly. Were there any links to photos? US 259 is closed, as well.